In the mid-1980’s Bo Jackson was perched on the edge of what looked to be one of the most incredible two-spots careers in history. Up until that time, two-sport athletes were not unheard of - in the 1910’s Jim Thorpe played both pro baseball and football and in the 1950’s Gene Conley balanced a career in both baseball and the NBA. The difference with Bo Jackson was that while his predecessors were obviously better in one spot over the other, Bo seemed to be as talented in football as he was baseball. After his Heisman Trophy-winning college career, Jackson signed with the World Champion Kansas City Royals as well as the Los Angeles Raiders. After a year in the minors, Bo hit a nice 22 home runs for the Royals his rookie year and celebrated his first All-Star at bat by clubbing a 448-foot home run. By 1989 he was a human highlight reel in baseball, and at the same time his football career took off. His first season with the Raiders established him as an up and coming running back, but just as his fame peaked, tragedy struck. A routine tackle turned into a football career ending hip injury. Jackson focused on baseball, but his injury affected his speed and co-ordination at bat. The Chicago White Sox picked up Jackson in 1991, and Bo spent the next year recovering from hip surgery. In a well-publicized story, Bo promised his ailing mother that he would hit a home run for her when he returned to the White Sox. And although she did not live to see it, Bo did indeed hit a home run in his first at bat upon recovering from surgery in 1993. 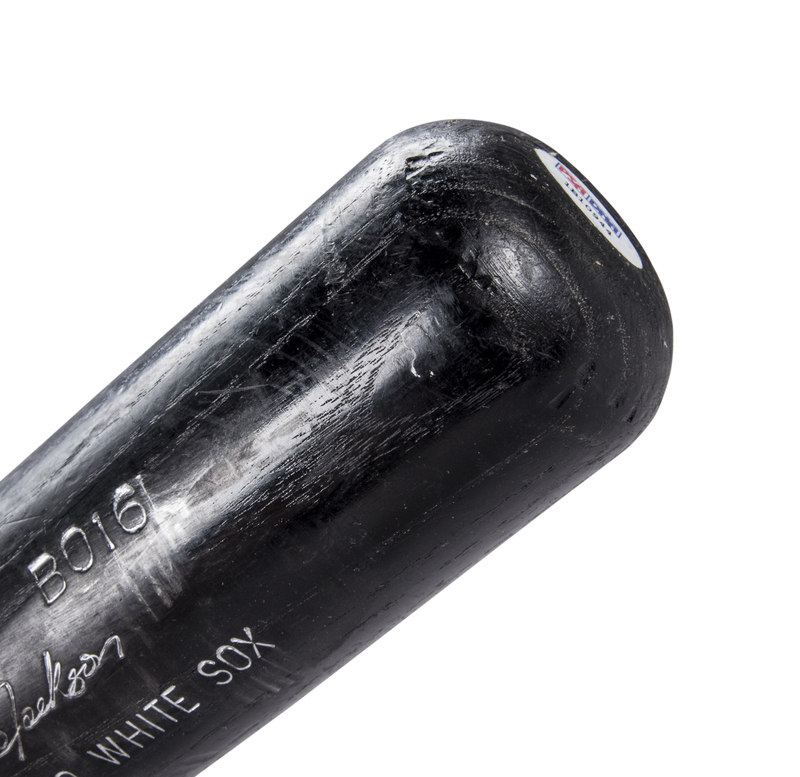 This Bo Jackson gamer dates from the two-sport superstar’s three seasons spent on Chicago’s South Side. Bo’s Louisville Slugger B016 model bat is un-cracked and exhibits outstanding use. 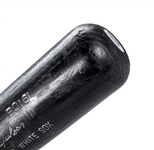 The many ball marks with stitch impressions found on the barrel proves beyond a doubt that “Bo Knows” how to pound a baseball. The ball marks include blue ink transfers and white leather scuffs on the left, right and front barrel. The barrel and knob ends show scuffing from contact with the ground and other equipment. The silver stamping is bright and Jackson’s silver pen signature leaps off the black stain finish. Weighing in at 31.7 ounces and measuring 34 inches, this gamer displays the grit and determination that typified Bo Jackson’s extraordinary dual-sports career. 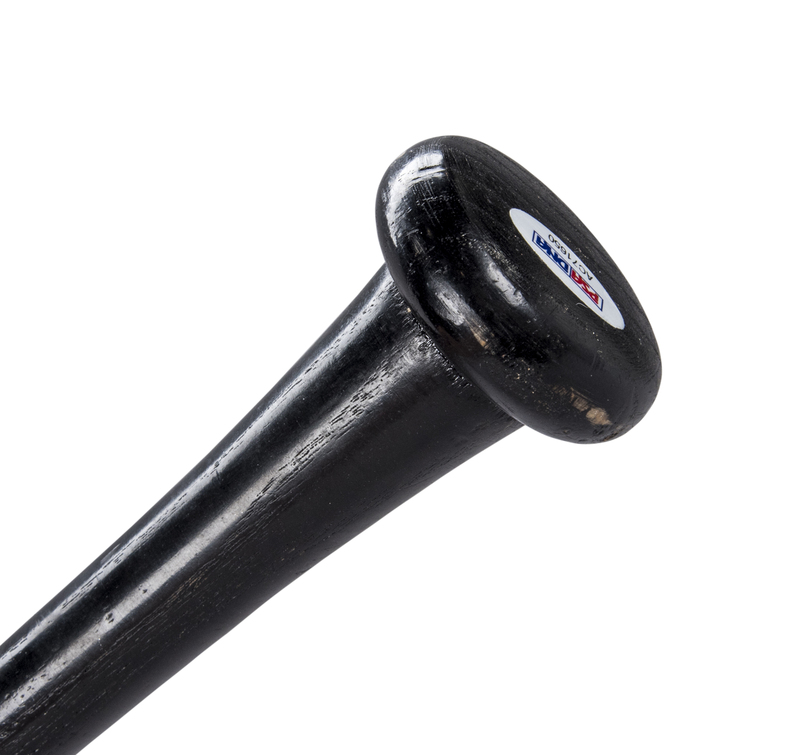 This bat comes with a LOA from PSA/DNA (1B10944) for the game use and has been graded a near-perfect GU 9.5, plus a COA from PSA/DNA (AC71650) for the signature.